Robbie is working at a fish shack and living at a skate park in North Carolina this summer (which is pretty much the sum total of everything I know about his current status, which I think demonstrates pretty good parental awareness, given that he is a fourth child) and I guess they cook for themselves cuz he texted me the other day, asking for instructions on how to make his all-time favorite meal. Given that a lot of popular blogs feature “Tempting New Recipes!”, I figured I’d jump into the culinary fray and share the info with you too – although let me just say right up front that, while this meal is a Berndt Family Classic that gets trotted out for pretty much every birthday dinner (except mine), I will not blame you if you don’t find it the least bit tempting (because I don’t). 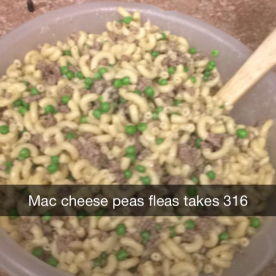 Even the dish’s name (coined by my mother, who invented this meal during my childhood), is a little off-putting: Mac-n-Cheese and Peas and Fleas. Peel the cheese (are you drooling yet?) 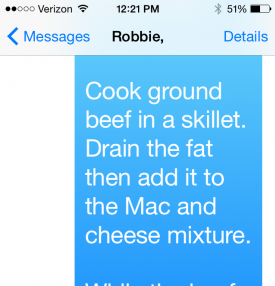 and add it to the hot macaroni. Add the butter and the milk and stir over low heat until the butter and cheese are all melted. Meanwhile, boil the peas in a small amount of water, just until they are no longer frozen…no need to cook ’em for more than about two minutes. Drain them, and then add the peas and the ground beef to the macaroni mixture. Stir it all up and add your garlic salt and pepper. Top with shredded parmesan cheese if you want to look a little fancy (we usually skip that step), and enjoy! I asked how the crew liked it, and he said it went over well…although one girl “freaked out” when she saw him adding the fat from the burger meat back into the macaroni pot. Friday Prayer for the U.S.A.